The $84,000 question: eat or drive? Go in peace if you're looking for a 2008 BMW M5 priced anywhere near its sticker of $84,000. It's sure to become a collector's item, and eBay is probably the easiest way to find one right now since all dealer copies are likely sold. If history holds true for the M5's resale values, this year's model should be as affordable as a Ford Taurus by about 2019. The 2008 BMW M5 has electrifying performance, but is saddled with an overdose of technology and a body in need of a few nips and tucks. The car enthusiasts and experts at TheCarConnection.com researched 2008 BMW M5 road tests from around the Web to produce this comprehensive review. TheCarConnection.com's editors also drove the 2008 BMW M5 and added more detail and information where needed, and they've augmented other expert reviews with their own opinions where it helps you make a better car-shopping choice. The 2008 BMW M5 is a case study in the good, the bad, and the ugly. The good? The fastest, most muscular, most precise four-door ever from BMW will rocket from rest to 60 mph in 4.5 seconds, corner like a front-engine race car, and brake so hard it can bounce your eyeballs off the windshield. Blame the standard 500-horsepower V-10 engine, derived from BMW's race cars. The bad? It's a case of technology run amok. BMW's frustrating iDrive controller for audio, navigation, and climate settings needs its own manual, and it's a dull, dry read. The technology that commands the suspension, steering, and throttle inputs offers a bewildering 279 combinations through an MDrive menu that can be linked to the steering wheel's MDrive button, which might as well be a panic button for users who can't figure it out. And BMW's semi-manual SMG transmission is only for fans of a truly harsh shift experience. The no-cost six-speed manual is a far better choice. It's a gem, with crisp throws, precise gates, perfectly arranged pedals, and surprisingly smooth clutch engagement. Then there's the ugly, which is, as always, in the eye of the beholder. The 2008 BMW M5's styling will not be encased in a museum like a Jaguar E-Type. TheCarConnection.com's editors thoroughly disliked our test car's optional Madeira Walnut trim, a reddish-brown wood with horizontal graining that looks painted on with a coarse brush. There is brushed-aluminum trim for the discerning buyer, though. Worst of all? The 2008 BMW M5 costs $84,000 and is in such limited supply, few folks will even have to worry about its bad points. It's a shame more people won't have the chance to sample one, because it's a stunning performer, made all the more fascinating by its hugely obvious flaws. The M-specific styling touches are nice, but the 2008 BMW M5 isn't anything you haven't seen before. Some might call the styling on the 2008 BMW M5 classic; others might simply refer to it as boring. This is always a highly subjective category, but one thing that most people will agree on is that the 2008 BMW M5 is far from the most exciting-looking vehicle on the road. The M5 BMW is, according to Edmunds, a "high-performance variant of the midsize 5 Series performance sedan available in one trim only." 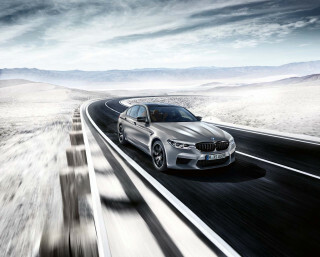 For the most part, reviews read by TheCarConnection.com indicate the BMW M5 looks similar to its brethren, though Cars.com says that the M5 has a "unique front face to distinguish it from other 5 Series sedans." ForbesAutos adds that the BMW M5 "does look different than the standard 5 Series, but not different enough for the average driver to immediately notice." Kelley Blue Book notes that "critics have been harsh on BMW's current styling," but they also comment "all 5 Series models get styling enhancements for 2008." Among those styling enhancements are "redesigned headlights, taillights, front air dam, rear bumper and rear diffuser," while "the M5 sports a deeper, more aggressive front air dam with larger center air intake and brake air inlets." ForbesAutos also reports that the 2008 BMW M5 features "deeper side sills, a decklid spoiler and four tail pipes large enough to spit tennis balls." Moving to the interior, Kelley Blue Book notices several changes right away when compared to previous M5 BMWs, including the "power window switches relocated to the armrests" and the "leather-wrapped center console and passenger door handles." The BMW M5 gets "special brushed aluminum trim" says MyRide.com, "but you can choose from two different wood tones if you want a warmer cabin atmosphere." Edmunds feels the interior "looks unchanged," though "a few key updates" have been made for the current model, including a "simple, modernistic dashboard" with an attempt at simpler controls for iDrive. ForbesAutos voices frustration at the car's "blithering adjustability," calling the M5 BMW a "technologically overloaded sport sedan." One of the major drawbacks to all the adjustability on the 2008 BMW M5 is that it calls for a lot of buttons and controls, which MyRide.com notes number "nearly 50-some." ForbesAutos also laments the BMW iDrive system, which they feel resembles a "fearsome cave of menus, settings and choices" that require reading the owner's manual and spending "a Saturday navigating the deep recesses of the cave" to master. Muscle car power, sports sedan handling, and a plush ride--the 2008 BMW M5 has it all. The 2008 BMW M5 comes with a massive V-10 engine, but power is far from the whole story on this super-Bimmer. Superb handling has always been a BMW hallmark, and on the 2008 BMW M5, that handling is accompanied by a surprisingly comfortable ride. The M5 BMW "boasts a 5.0-liter V10 that generates a maximum 500 hp at 7,750 rpm and 383 pound-feet of torque at 6,100 rpm," according to Edmunds. 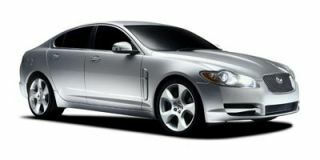 The engine, which is one of the most powerful on the road today, gets high marks in reviews read by TheCarConnection.com. MyRide.com loves how "the V10 gurgles and gently shakes like a 1950 International Harvester," noting how it "ominously" shows off its "tremendous power and latent energy." Cars.com writes that the V-10's power is enough to move the BMW M5 "from a standstill to 60 mph in 4.5 seconds" and "120 mph in 15 seconds," both spectacular numbers for a four-door sedan. Kelley Blue Book is equally impressed, calling the 2008 BMW M5 "the fastest, most muscular" sedan on the market. The M5 BMW offers two transmission choices for 2008, which Cars.com notes are a "conventional six-speed manual transmission" and a "seven-speed sequential manual transmission with steering-wheel paddles or a conventional six-speed manual gearbox." This seven-speed sequential manual gearbox, or SMG, "includes 11 shift programs selected via MDrive, as well as a launch control mode that primes the M5 for aggressive acceleration," according to Edmunds. Kelley Blue Book writes that the SMG "can shift automatically or manually with the console lever or steering wheel paddles," but they also say "in normal driving, and with a skilled driver, it is actually slower and less smooth than the conventional manual transmission." Because of the occasional reluctance of the SMG, most reviews read by TheCarConnection.com recommend the traditional six-speed manual on the BMW M5, which Kelley Blue Book contends will offer "crisp throws, well-arranged pedals and smooth clutch engagement." While the 2008 BMW M5 is highly capable of giving you more power than you know what to do with, that power comes at a high cost. With either transmission, the EPA estimates that the BMW M5 will get 11 mpg in the city and 17 mpg on the open highway. As a result, ConsumerGuide reviewers list fuel economy as one of the details they dislike about the M5 BMW, noting in addition that "all models require premium-grade gas." BMW performance has always been about so much more than sheer power, and nowhere is that more true than on the 2008 BMW M5. Reviewers simply rave about the M5 BMW's performance capabilities, and Edmunds calls the 2008 BMW M5 "an extremely balanced machine that can handle aggressive driving maneuvers as well as it does dilapidated highways." ForbesAutos says that the 2008 BMW M5 "corners like an open-wheel single-seater race car, with no apparent end to its grip," while Kelley Blue Book reports that the BMW M5 is the "most glued-to-the-road four-door on the market." The performance on the BMW M5 is highly customizable as well, since Car and Driver points out that you can modify the "damper, steering, shift, power, and stability settings" to your liking. Braking also earns high praise from reviewers, with Kelley Blue Book claiming that the "braking might leave you feeling as if it has hooked an aircraft carrier arresting cable." On most high-performance cars, such incredible handling would come at the expense of everyday comfort, but that is not the case on the 2008 BMW M5. "Thanks to its Electronic Damping Control," Edmunds says, the BMW M5 "is actually quite compliant, with the suspension swallowing all but the harshest bumps." 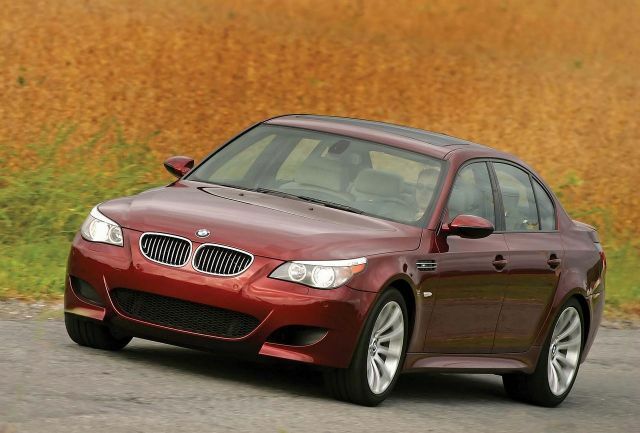 The 2008 BMW M5 is top of the line, though there's always room for improvement. With a price tag north of $80,000 and an M badge on the back, the 2008 BMW M5, as you might expect, should deliver in the performance category. Furthermore, with a BMW logo on the front, the M5 BMW should also come through fully in terms of comfort and quality, and reviews read by TheCarConnection.com show that it doesn't disappoint. The 2008 BMW M5 offers high performance and room to seat five comfortably. Up front, Cars.com notes that "heated M Sport front seats with 16-way power adjustment for the driver" are standard, while the passenger seats are 14-way adjustable. 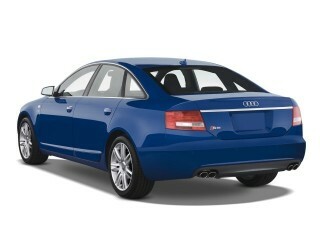 MyRide.com reviewers add "the spaciousness of the cabin makes for one of the most comfortable rides around." Edmunds agrees, saying "the supportive seats and commodious backseat further serve to make this an easy car to live with every day." Edmunds does, however, recommend that buyers stick "with the standard 16-way adjustable front seats" because the 20-way adjustable M multifunction seats, which are optional, are "equipped with active backrest bolsters that move inward to brace the driver (or passenger) against cornering loads," and as good as that sounds, the feature is "gimmicky" and makes for distraction at "critical moments." And ConsumerGuide reviewers remark that while headroom and legroom in the M5 BMW are good in the front, headroom is only adequate in the back, and legroom "can grow tight" when the front seats are pushed "far back and lowered." One of the few complaints in this category regarding the BMW M5 concerns cargo room, which ConsumerGuide says is marginal, noting that "the trunk isn't very wide or deep" and "interior storage is disappointingly meager." MyRide.com notes that the maximum cargo volume inside the BMW M5's trunk is 14 cubic feet, which is a bit of a disappointment. When reviewing the M5 BMW, it's hard to stay negative for too long, and despite the less-than-impressive cargo space, the 2008 BMW M5 returns to its superlative form when it comes to quality. Edmunds reviewers report that "build quality and materials inside the M5 are outstanding," and Kelley Blue Book says that the "brushed-aluminum interior trim can be replaced by either of two no-cost optional woods, and its high-end Merino leather can be optioned up to perforated leather and to cover the entire dash." Car and Driver adds that "leather covers nearly every part of the M5's lavish interior," and they feel that the cabin is "a huge improvement over the regular 5-series interior and make[s] you feel as if you were in a four-door Ferrari." MyRide.com reviewers are also impressed by the "signature M Series logos and tri-color stitching on the seat backs and leather-wrapped steering wheel," all of which increase the luxurious ambiance. The impeccable build quality on the 2008 BMW M5 also helps keep exterior noises from intruding into the cabin. ConsumerGuide reviewers report "wind rush is minimal at highway speeds." However, Edmunds raises one issue with sound on the BMW M5, reporting the engine delivers "a tinny exhaust note" they feel is inappropriate for a car as capable as the M5 BMW. The 2008 BMW M5 has crash-test scores that simply aren’t competitive with top-drawer luxury sedans. The 2008 BMW M5 possesses a myriad of features that can make anyone feel safe, according to reviews read by TheCarConnection.com—but its crash-test scores don’t back up that impression. The 2008 BMW M5 itself hasn't been tested by either of the crash-test authorities, but the virtually identical 5 Series on which its based has, and you can expect similar results in M5 BMW crash tests. In National Highway Traffic Safety Administration (NHTSA) tests, the 5 Series scored quite well, with one notable exception: The NHTSA awarded the BMW 5 Series a perfect five-star rating for side impact tests, as well as a five-star rating for passenger-side front impacts. Unfortunately, the 2008 BMW 5 Series, and accordingly the M5 BMW, earned only three out of a possible five stars for driver front-impact protection. That result is at odds with the BMW M5's ratings from the Insurance Institute for Highway Safety (IIHS), where it earned the highest possible rating, "good," for the IIHS's frontal offset impact test. Also, without the optional side impact airbags installed, the BMW 5 Series only earned a "marginal" score, the second-worst score possible, in the IIHS side impact test. When it comes to safety features, the 2008 BMW M5 is, for the most part, loaded. Cars.com reports that the BMW M5 has "side-impact airbags for the front seats, side curtain airbags and Dynamic Stability Control" as standard, as well as "traction control," according to Edmunds. Kelley Blue Book also notes the "sophisticated set of electronic stability, traction and brake controls" included on the M5 BMW. In terms of optional safety features, the BMW M5 offers two. Edmunds lists these M5 BMW safety add-ons as "rear seat side airbags and active head restraints," which move forward to help prevent whiplash in the event of a collision. Visibility on the 2008 BMW M5, which can be an overlooked component of the safety equation, is just average, according to reviews read by TheCarConnection.com. 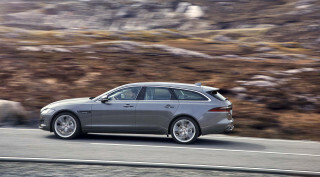 ConsumerGuide specifically reports "visibility is just OK over the shoulder and to the rear." Fortunately, Cars.com notes a "Park Distance Control" system comes standard to help with close parking maneuvers. The 2008 BMW M5 doesn’t want for features, which is to be expected in a luxury car at this price. The luxury European manufacturers seem to be in something of a high-tech features war, with BMW and Mercedes-Benz battling it out for the title of most silicon-dependent vehicles. With the 2008 BMW M5, BMW has fired its latest shot in this war, and the high-end features are definitely impressive. The 2008 BMW M5 is available in only one trim level, so there is no variation in standard features. Kelley Blue Book catalogs several features that come standard, including "a DVD-based navigation system with real-time traffic information, special M instrumentation and sport steering wheel, heated front seats with adjustable backrest width, Xenon Adaptive Headlights and ultrasonic Park Distance Control." In addition, Cars.com reports that "a Logic7 premium sound system" comes standard on the M5 BMW. While these features all receive generally positive reviews in articles read by TheCarConnection.com, the same cannot be said for the iDrive and MDrive systems on the 2008 BMW M5. The iDrive system in particular still gets a lot of flack from reviewers. It operates "climate control, entertainment, navigation [and] telephone," says MyRide.com, but according to ForbesAutos, you need to "spend a Saturday navigating the deep recess of the cave" of iDrive menus and instructions in order to operate it. However, the BMW M5's MDrive system is much better and "lets the driver select preferred performance and handling settings for instant recall later," attests Cars.com. However, Edmunds notes that with the MDrive system "BMW added up all these possible combinations and came up with 279," which many drivers might find intimidating. For those who refuse to settle for the standard features on the BMW M5 ("settle" being a relative term here), BMW offers a decent options list for the M5 BMW. According to Edmunds, some of the "stand-alone options include 20-way multifunction seats with active backrest width" and "heated rear seats." Kelley Blue Book also reports "the M5 offers an enticing array of options" that include "Comfort Access keyless unlock and start, M Head-Up Display," and "heated steering wheel." The head-up display on the BMW M5 gets quite a bit of positive press in reviews read by TheCarConnection.com, with MyRide.com reporting that "the $1,000 system projects a color image onto a six- by three-inch field above the dash on the windshield, so you don't need to take your eyes off the road." They add "it can be programmed to show speed, navigation instructions, or cruise controls settings," and are impressed that "it's clear even in the brightest sunlight."